Born in Norwich, Norfolk, England c1818 to James and Ann Blythe, my great great-grandfather Robert was transported (together with his father James) to VDL in 1842 for theft. From the government records, newspaper reports and family stories, it seems he was a bit of an unsavoury character, or did he just fall in with bad company?? Robert (no 2243) and his father James (2244) were convicted of larceny in a court in York on the 5th January 1841. 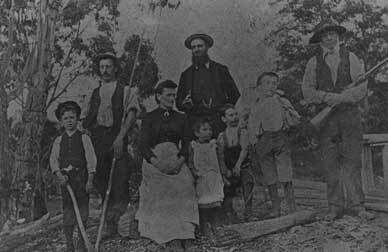 Together they were sentenced to be transported to Van Diemen's Land, each for a period of 14 years. Research so far into the trials has yielded no results. From an archives@york.gov.uk researcher I received word that "At the time of the trial, Yorkshire was split into three, the thirds being called Ridings from the an old Scandinavian word. The York ( E.R. ) listed on the convict record from Archives of Tasmania signifies that the trial would have taken place at Beverley." The Beverley Archives were unable to find the name on their database, although they did have a James Blythe in 1790". They arrived on the "Layton 4" on 1st September 1841 after a journey of slightly less than six months. Both father and son were educated as it is noted on their records that each could read and write. James Blythe was recorded as being a 54 year old ploughman, native of Norwich City, Norfolk. He was married to Ann and had one son. Being a native of Norwich may indicate that this is where they were born, a little mystery to solve! However on the following day he was tried for the armed robbery of 201bs tea, 401bs sugar, 401bs bacon, 9 coats, 5 waistcoats and a silver watch. Robert was found guilty on this count and sentenced to death, however, luckily for us, he received a reprieve and the sentence was commuted to transportation for life and it was recommended he spend the next 10 years on Norfolk Island. He arrived there on 26th Jan 1847 and must have had a miserable existence, spending quite an amount of time in solitary confinement for misdemeanours such as disobedience, misconduct and insolence. Martin Cash in his self titled autobiography paints a grim picture of life as a convict on Norfolk Island. He was there at the same time as Robert. Robert met Louisa Kaufmann when he was working in the Bothwell area sometime around 1856-57. They were married at the Bothwell Church on 2nd June 1857, he claimed he was 22 years of age and she was 21. Robert was in fact 40 !!. Louisa it seems had a sad and difficult life, she died after spending two years in the New Norfolk Hospital for the Insane in 1874. She had been admitted after the birth of her last child George and was simply suffering from post-natal depression. It seems Robert spent a good deal of his life in Tasmania working as a shepherd, roaming the Midlands, Highlands and North East Tasmania before settling at Prossers Forest on fifty acres of land. Bert Smith Jr, Alf Blyth Snr, Bridget Blyth, Bert Smith Snr, Cis Blyth, Alf Blyth Jnr, Bonner's boy and Robert Blyth. The admission register of 1872 when Louisa was certified as a lunatic and taken away to the New Norfolk Hospital for the Insane, provides some more detail on Robert's circumstances at that time. Dr William Mason certifies that Robert Blyth is " a small farmer occupying fifty acres principally bush land. He has a cart and two horses constantly employed in conveying split timber into Launceston. We are of the opinion that he is able to pay one shilling per diem (per day) toward the maintenance of his wife." Quoted from Memories of Myrtle Bank by JR Skemp "Upon being freed many of the convicts became bush selectors, some of them were decent citizens who had been transported for trivial offences, but others were habitual criminals, often drunken and degraded, frequently they were thieves and generally regarded with disfavour by their fellow settlers". Skemp also mentions a number of old lags living in the Myrtle Bank area, however Robert did not receive a mention (at least not under his real name).He may have been classed as a bush selector. Robert lived to the age of 8O. He died on the 11th Oct 1898 at the Launceston General Hospital. The certificate (Ref AOT 389/1266) listed his cause of death as being senility/bronchitis. He was buried two days later at the Church of England Cemetery, Cypress St. Launceston. This cemetery no longer exists, it is now a sports field.